Gargalianoi, also Gargaliani, is a community located in the western part of Messenia. It is passed by a highway. 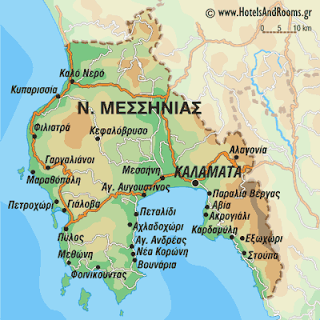 It is located south of Pyrgos, Kyparissia and 15 km south of Filiatra, north of Pylos and Methone and west of Kalamata (68 km) and Messene. Its neighboring villages are Pyrgos to the east, Valita to the north and Marathopolis to the west. It is also a municipality with the seat being this town. The town has a school, a lyceum, a gymnasium, a kindergarten school, a church, some squares named Kentriki Plateia, , the central square of Gargalianoi along with Kolokotroni Square, banks and a hotel named Ionian View. The sporting facility is to the west. The area outside the city is surrounded with hills covered with olive trees and grapevines. Its nearby camping site is Camping Proti in Marathopolis.